I think this will be my last pic taken in 2010. Tomorrow we will move into the new year! 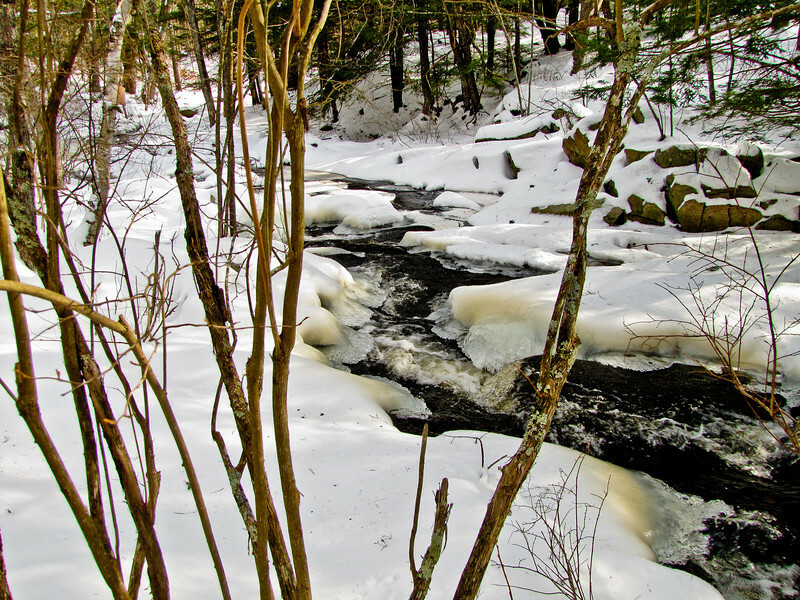 This is Emmon’s Preserve again, in Kennebunkport Maine, with the little Baston Brook (river?) running down over ledges away from us. It was a difficult shot to frame as there was no clear line of site. This is the wider view, which I also quite like, despite its busy foreground. If you compare the two you will see that I had to clone out the little branch tip in the first shot. Canon SX20IS at 85mm equivalent, f4 @ 1/125 @ ISO 80, Snow Mode, and at 28mm equivalent, f4 @ 1/250 @ ISO 80, Snow Mode. Processed in Lightroom for intensity and clarity (see page link above). I suppose there is no real surprise here…other than the fact that it is possible. This is what even the most rapidly flowing, swirling, jumping water coming down a little series of falls in Maine looks like when it freezes. It captures the motion in solid form. 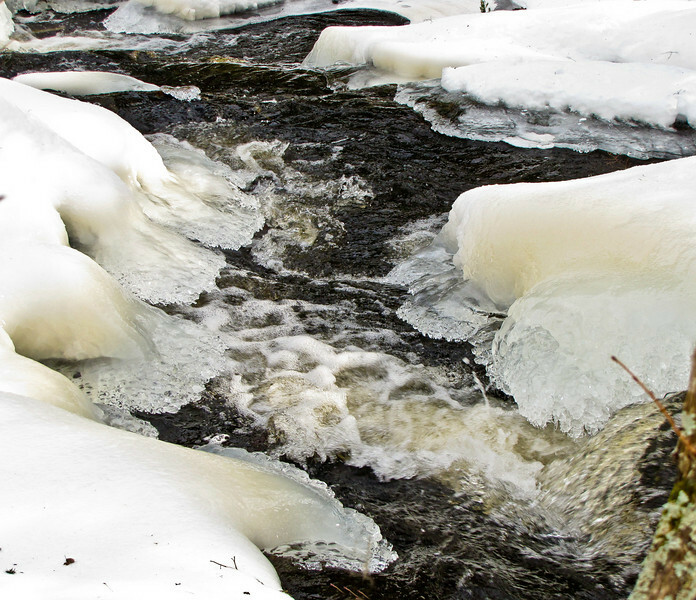 It turns the music of the rapids into intricate folds and fingers of ice. How? I will admit, I can not quite imagine it. But then I don’t really need an explanation. It is enough to find it there on my walk…to see it for what it is…and to bring it home to share with you…to bear witness. It is an instance of truth that must be seen to be believed, and that, once seen, is sufficient to itself. It is Sunday, and you might be ahead of me with where this image is leading me. Because, of course, what I see and appreciate in this image shares an identity with what I see and most appreciate in the spirit. The essence of faith is that it is possible even when we can’t imagine how…but it is also truth apprehended, seen, touched, felt, experienced…that is sufficient to itself, beyond the need for explanations. Like dancing water frozen and yet in still in motion, truth is something we must experience, and that we can only bear witness to. With no spiritual camera to bring back the evidence to share, I have no choice but to become the dancing water, to let the frozen motion form within me, to let truth perceived shape my life into a living witness. In that sense, what matters here is the taking of the image, and its sharing, not so much the image itself. Canon SX20IS at 560mm equivalent, f5.7 @ 1/200th @ ISO 200. Snow Mode. Processed for clarity and intensity in Lightroom. Take one more look at the image before you read all about the difficulties of making it. 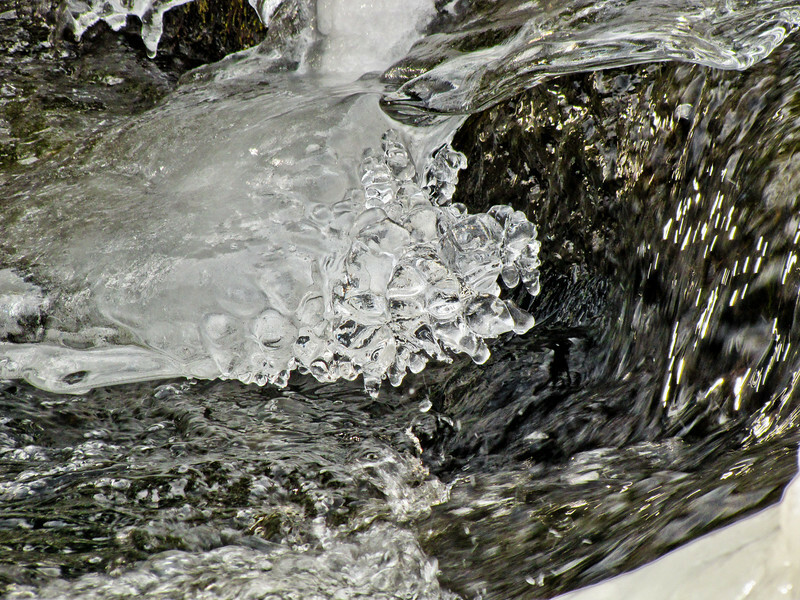 A little curl of water and lacy ice surrounded by snow, and an all but impossible exposure problem. I decided to let the snow go completely white, in order to bring some light and life to the flowing water and some texture to the ice. I tried it both ways. This is one of those cases where I over-ruled the built in Snow Mode using Exposure Compensation. 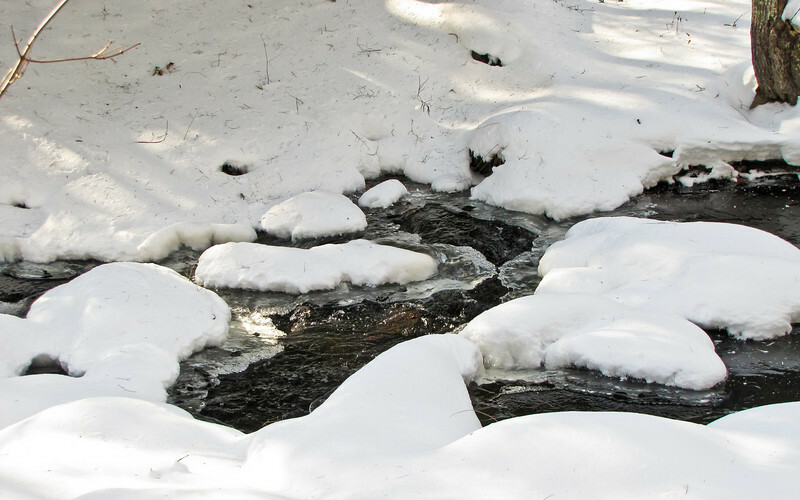 Unfortunately, the snow goes gray very quickly, if you decrease exposure, and the water goes too dark. All in all I prefer this standard Snow Mode treatment. 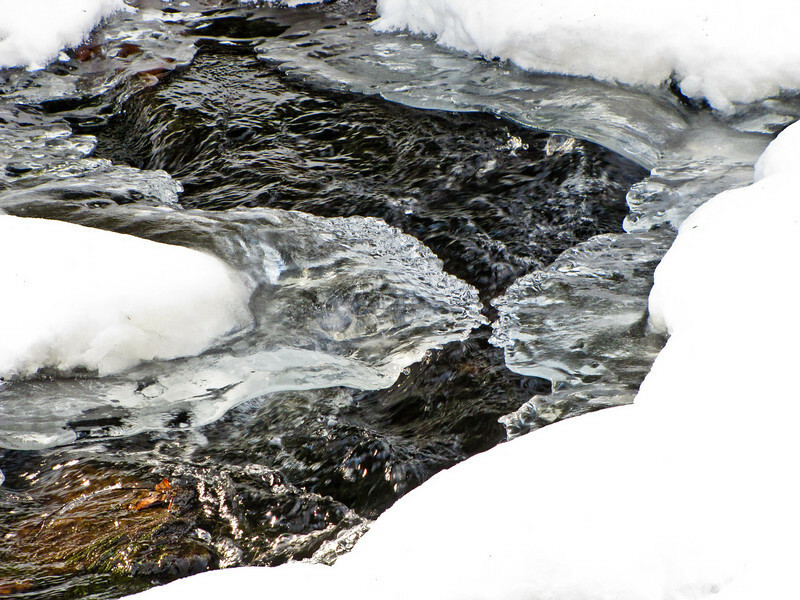 The tight crop, is, of course, to emphasize the pattern of ice and water. This is what it looks like pulled back a bit. You can see from the dappled light patterns that the adjacent snow happened to be in sun patches on both sides. Canon SX20IS at 290mm equivalent, f5 @ 1/80th @ ISO 200. Snow Mode. Wide shot at 70mm equivalent, f4 @ 1/160 @ ISO 80, also Snow Mode. Ah yes…but that is just technique…the image either stands as it is, or it does not. Deer in the water wading among the ducks is a slightly incongruous sight. 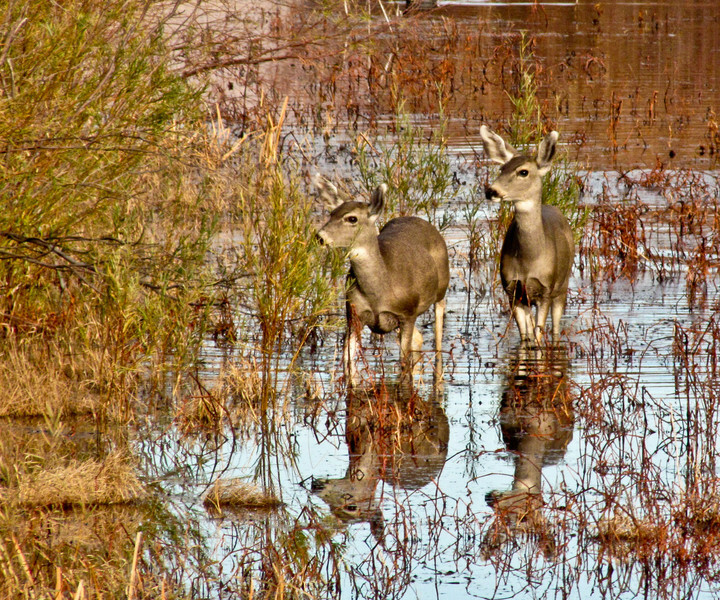 As usual at Bosque del Apache, at least during the Festival of the Cranes in November, someone was already stopped and taking pictures of this group of Mule Deer crossing one of the irrigation channels. I pulled up behind and grabbed these shots with the Canon SX20IS out the window. As the deer came up on the dyke between enpondments, they showed so little concern for the gathering crowd on the road (for, of course, two stopped cars attracts a third, and three a forth, etc.) 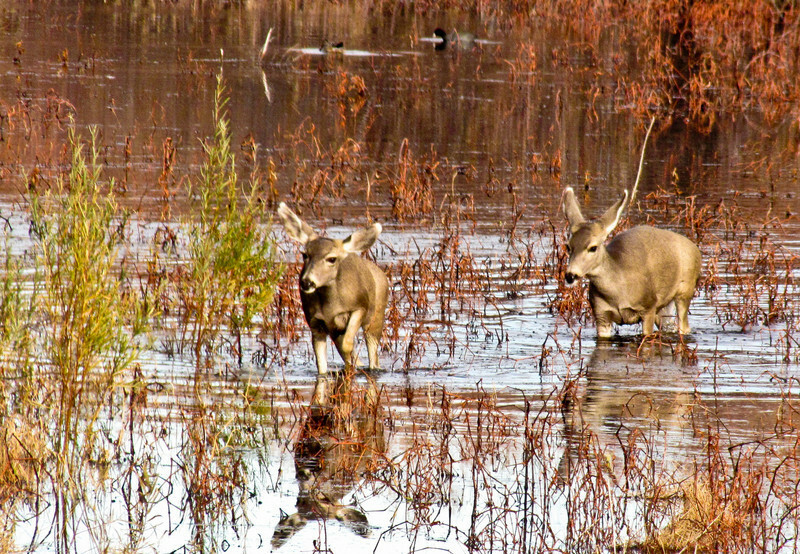 that I got out and digiscoped them (see Mule Deer). Canon SX20IS at 560mm equivalent, f5.7 @ 1/200th and 1/400th @ ISO 200. Programmed auto. Processed for intensity and clarity in Lightroom (see page link above). Both are cropped form the full frame. 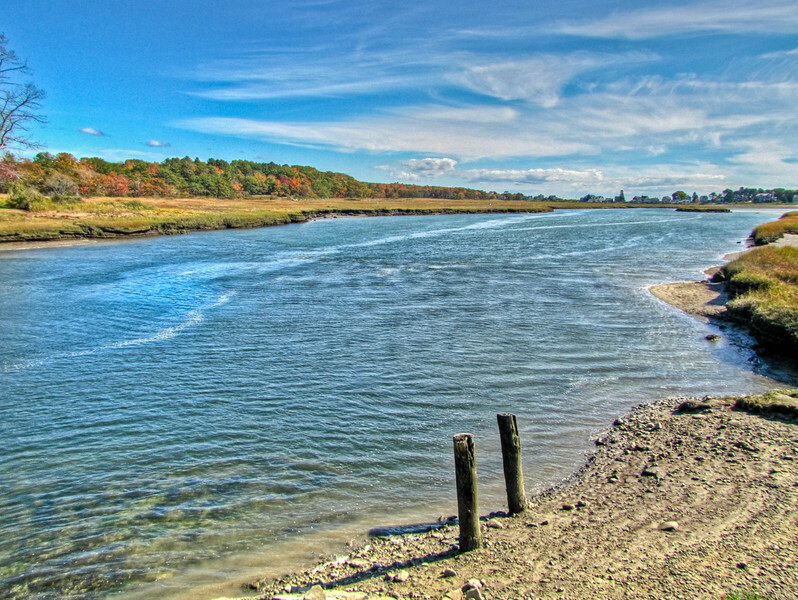 This is another autumn HDR, looking down the Mousam from the Route 9 bridge toward Great Hill and the sea beyond. The sky is interesting, but for me, it is the light on and in the water that makes the shot, especially balanced against the fall foliage behind the marsh. I like the way wind and current draw patterns in the water. The two posts redeem what would otherwise be a rather ugly patch of mud and stone, and, for me, draw the eye to the transparency of the water along the shore. Canon SX20IS. Three exposures, auto bracketed over 2EV with the center moved down 2/3rds EV. ISO 160. Exposures blended and tone-mapped in Photomatix. A touch of Fill Light and Blackpoint just right in Lightroom. Added Clarity and Vibrance. Sharpen narrow edges preset. My daughter was accompanist for a young lady in a voice competition at Bates College yesterday, and I was chauffer. I had my laptop with me to do some video processing, but first, of course, I took a walk around the campus to see what I could see. 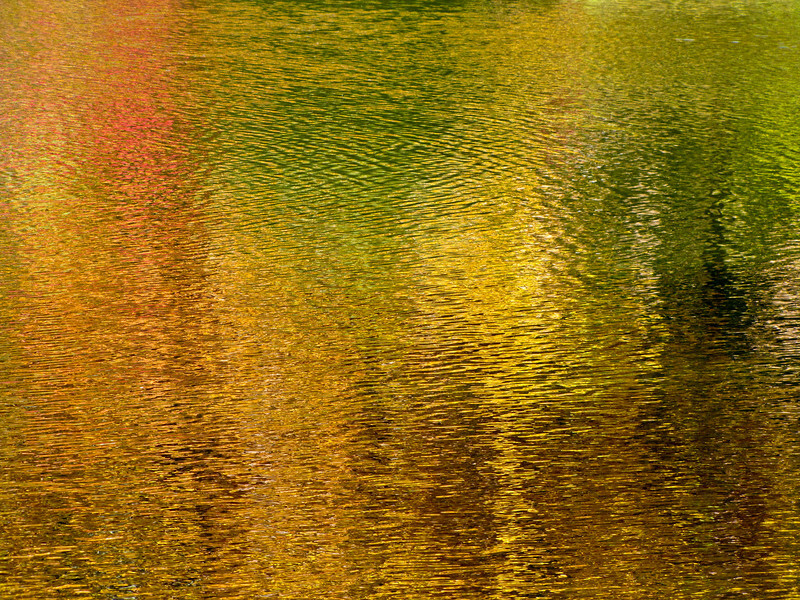 There is a decorative pond right next to the Olin Arts Center, and between the morning light, the lingering fall colors, and just enough wind to fracture the surface of the water, the reflections were irresistible. Here they are set off by the foreground cattails. Canon SX20IS zoomed in to about 160mm equivalent for framing, f4.5 @ 1/200 @ ISO 200. Landscape program. Some Fill Light for the foreground in Lightroom, Blackpoint right, added Clarity and some Vibrance, Sharpen narrow edges preset. And here is a shot, similar processing, zoomed out to a little over 300mm to isolate just the reflections. 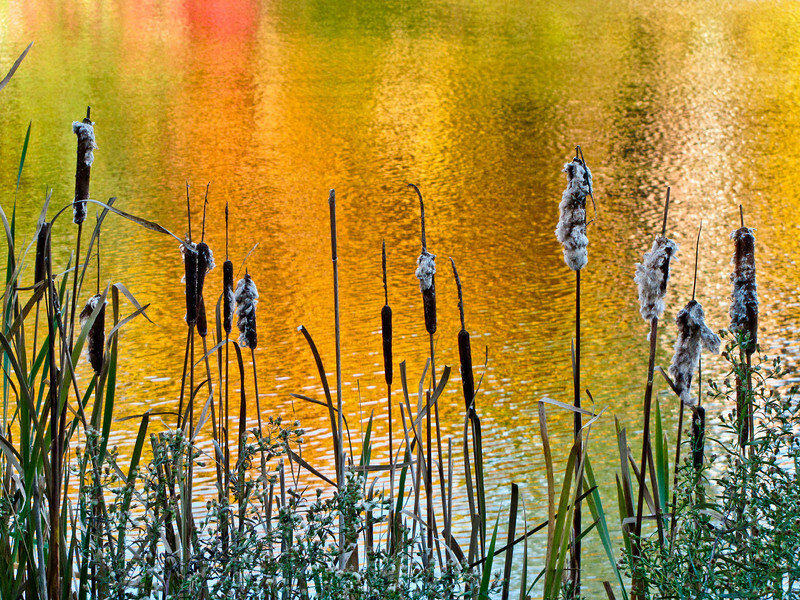 Which leads me to my Sunday reflection: I like both the bold splash of color across the wind fractured water, abstract because there is no particular resting place for the eye, a subject in itself, but hard to hold on to…and the way the mundane cattails in the foreground capture your eye and instantly put that glory firmly in the background. It is the way of life, isn’t it? Always confronted by the fractured reflection of the glory of eternity, our eyes are caught by the detail right in front of us…which should still, if we are seeing right, be displayed against that backdrop of glory. Old Falls Pond in West Kennebunk Maine is one of my favorite autumn color spots. It is across the road from Old Falls itself, which is my other most favorite autumn color spot. My most visited, most awarded, highest rated photo on flickr is a shot of this pond from several autumns ago. That was before I started working with HDR, and, though the leaves were not yet at peak, I took a run out last Sunday to see how it looked. (I am writing this from Jekyll Island GA, where I have spent every Columbus Day weekend for the past 8 years (work), so I never do see the traditional peak foliage in Maine.) 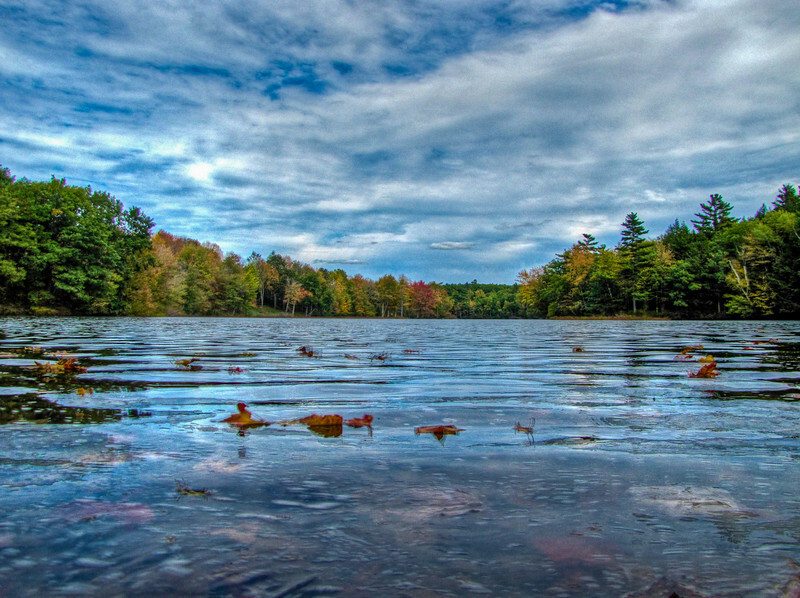 Still, Old Falls Pond was looking pretty good, and with a sky that just begged for HDR treatment. The low angle (camera almost touching the water), the floating leaves, the way the light runs on the ripples on the water, the glimpse of the bottom through the foreground, the foliage itself, and the sky overall with its strong diagonal slant…this image has enough going on to overcome the otherwise rather static composition. I did experiment with cropping out part of the sky to “improve” composition, but I like the full shot better. Three shots with the Canon SX20IS at 28mm equivalent, auto bracketed, with the –2/3s EV exposure compensation. Exposure was blended and tonemapped in Photomatix, and the resulting image was processed in Lightroom using Fill Light, Blackpoint, Clarity and Vibrance, and the Sharpen narrow edges preset. Finally I applied a Graduated Filter Effect to the lower third of the image, reducing brightness slightly, which had the effect of making the water more transparent, for that hint of bottom. Which goes to show you, I think, that if you are at your peak, in tune with the creative spirit inside, the foliage does not have to be!